One thing I’ve been focusing on this past month is letting go a bit of the pressure to create a good series and going back to play and experimentation. Pinterest provides great resources and inspiration for embroidery patterns, visual textures, and generally awesome DIY ideas. One of the things I noticed myself pinning the most of is highly textural work. 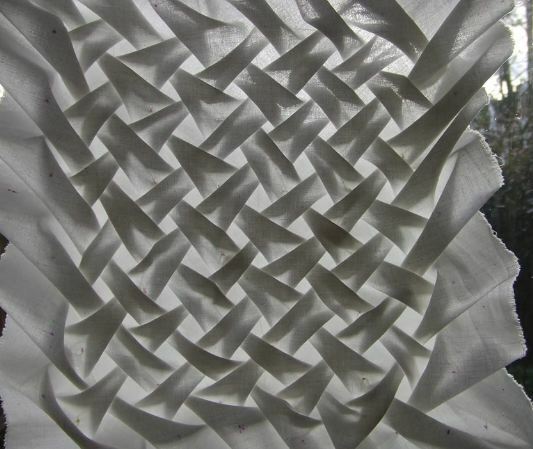 From Canadian smocking to Anne Kyyro Quinn’s incredible wall sculptures, I find myself leaning into my curiosity about these techniques unknown to me. Example of Canadian smocking – the artist used this pattern for indigo dyeing later on! So here is an in-process photo of that play. I’m just about to attack the hand embroidery. Stay tuned!